Written and directed by Joe Cornish (Attack the Block, Ant-Man, Hot Fuzz), the film is an entertaining mix of fantasy and reality, weaving together tales from King Arthur’s Court and contemporary life at Dungate Academy, where the main four young characters attend school. It starts out with two fast friends, Alex (Ashbourne) and Bedders (Chaumoo) being bullied by two older students, Lance (Taylor) and Kay (Dorris). Alex and Bedders are nerdy kids who are interested in magic, and are derided by Lance and Kay. Lance promotes himself as “king” of the school, and uses every opportunity to show it, backed up by his sidekick, Kay. Alex is brave and fights back, especially in defense of his friend. And one day, when he is running from Lance he ends up at a construction site, briefly assuming himself safe. But in a confrontation with Lance, he falls over backwards off a fence onto a pile of dirt. Lance and Kay leave him for dead, but when Alex comes to he sees a huge sword stuck in stone. Curious, he pulls it out with some effort, and runs home with it. This actually gets corroborated by a strange new student at school who does amazing things, simply with some kind of ritual he performs with his hands and arms. Merton/Merlin (Imrie and Stewart) informs Alex that he is indeed “the king”, and that he is charged with preparing for a major battle with someone evil for ownership of the sword. This is Morgana (Ferguson), King Arthur’s half-sister, who has been chained up in vines against a rock for centuries, struggling to get free. She is convinced she is the rightful heir to the throne, and knows that her success requires that she possess the sword (Excalibur). Alex and his three friends/enemies (he needs the aggressive qualities of the bullies in his quest), whom he has knighted, set off to Tintagel Island to locate the entrance to the underworld and wage battle with Morgana. Along the way, Merlin in his younger and older forms will guide and sometimes rescue them on their quest. Their journey is engaging; it’s only at the very end the movie starts falling apart. It would have been better if the last half-hour had been edited out. Production design (Marcus Rowland), cinematography (Bill Pope), and special and visual effects make this an enchanting journey that will keep children and adults raptly engaged. The dragons that appear in the night-time with their brilliantly lit swords trying to catch up with and attack the seekers are truly terrifying, and the way old trees uproot themselves to train the king and knights in fighting is cleverly done and humorous at the same time. 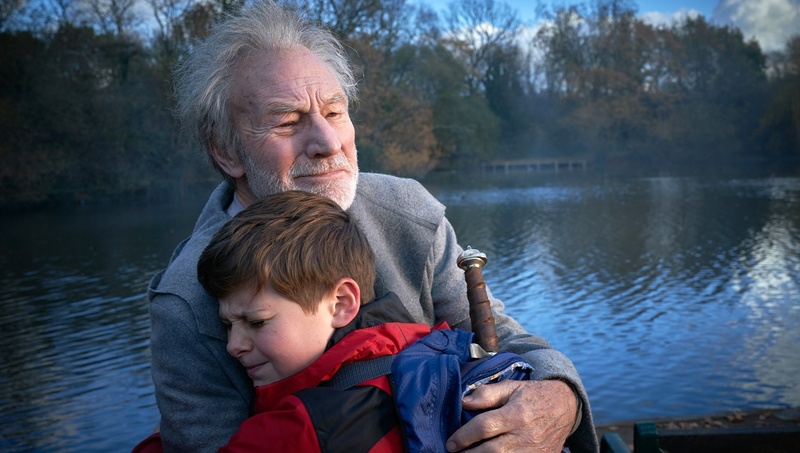 Alex(played by Director Serkis’ son) is a surprised but charming hero who wins you over with his wonder, valor, and smartness, which Ashbourne gracefully captures. Chaumoo as Bedders portrays an interesting kid whose loyalty and whose interest and devotion to magic is admirable, as well as providing welcome levity at times. Tom Taylor gives us a picture of an overly entitled, spoiled rich kid who needs to have his ears pinned back from time to time, but is one who finally learns from it. Rhianna Dorris evinces the loyal follower who is not quite ready to stand on her own. Imrie and Stewart playing the young and old Merlin grab your attention and keep you fascinated. Finally, Rebecca Ferguson convincingly shows us a ferocious, hag-like figure whose greediness for power is unmatched. With all its fantastical, other-world glamour, The Kid Who Would be King contains teaching moments for children (and adults in these modern times) about the necessity for cooperation in overcoming adversity, on the values in the chivalric code (honoring those we love, not being wanton, speaking truth at all times, and persevering to the end in any enterprise), overcoming disillusionment, and the value of diversity in any endeavor. With all its fantastical, other-world glamour, The Kid Who Would be King contains teaching moments for children.